DAPHNE, Ala. – Charles “Chuck” Wielgus, executive director of USA Swimming, has been awarded a 2016 Honorary Doctorate from the United States Sports Academy for his lifetime of service to the world of sport. 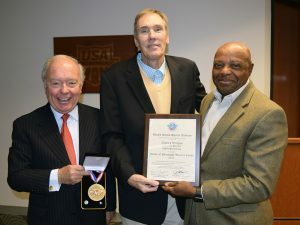 The presentation was made recently at the USA Swimming headquarters in Colorado Springs, Colo., by William Hybl, President Emeritus of the United States Olympic Committee and Chairman and Chief Executive Officer of the El Pomar Foundation, and Walter Glover, Executive Vice President of the U.S. Olympic Endowment. Each year as part of its Awards of Sport program, the United States Sports Academy presents two honorary doctorates – one national and one international. Recipients are presented with a hood, citation, plaque and transcript signifying their honorary degree. Wielgus is widely credited for making swimming the most successful of Team USA’s Summer Olympic sports, having served as the executive director of USA Swimming since 1997 and as chief executive officer of the USA Swimming Foundation since its inception in 2004. During his tenure, Wielgus has led USA Swimming through an extended period of growth in what has become an increasingly competitive marketplace. Membership in USA Swimming has surpassed 400,000, while organizational revenues and net worth have more than quadrupled under his direction. Under Wielgus, the United States Olympic Swim Team has won an average of 31 medals in each of the last five Olympic Games to lead all of Team USA’s medal counts. In the recent 2016 Olympic Games in Rio de Janeiro, U.S. swimmers collected 33 total medals, including 16 gold first place finishes. Wielgus is also credited with repositioning the U.S. Olympic Trials-Swimming into a major showcase event by moving the competition from a 4,700-seat natatorium to an entertainment venue with 15,000 seats. The 2016 Olympic Trials sold more than 200,000 tickets for 15 sessions at the CenturyLink Center in Nebraska. Additionally Wielgus has made strides in introducing American children to the sport of swimming by spearheading the creation of the USA Swimming Foundation and its Make a Splash initiative, which aspires to teach every child in America how to swim. Financial support to USA Swimming National Team athletes and coaches has also increased significantly under his leadership. “Being the recipient of the 2016 Honorary Doctorate is among the highest honors I can imagine receiving and this recognition is very meaningful to me,” said Wielgus. “The United States Sports Academy is proud to honor Chuck Wielgus, who has made a remarkable contribution to the sport of swimming in the United States,” said Dr. Thomas P. Rosandich, Academy President Emeritus and founder of the Awards of Sport program. Wielgus has dedicated most of his professional life to sport. Prior to his work at USA Swimming, the Larchmont, N.Y., native was the executive director of the Senior PGA Tour Tournament Directors Association. At the time he also served on planning committees for the World Golf Village and International Golf Hall of Fame. From 1989-96 he was the executive director of the United States Canoe and Kayak Team, the national governing body for that Olympic sport. From 1983-89 Wielgus was the executive director of the Hilton Head Island Recreation Association, where he led the effort to produce the master plan for the resort island’s public recreation facilities and sports programs. From 1974-83 he was a coach and recreation director in Woodstock, Vt., where he coached basketball, lacrosse and swimming and served two terms as the president of the Vermont Recreation and Parks Association. Wielgus earned his bachelor’s degree in history from Providence (Rhode Island) College in 1972 and his master of education degree from Springfield (Mass.) College in 1974. He was recognized as a Sports Ethics Fellow in 1996 by the Institute for International Sport at the University of Rhode Island in Kingston, R.I., and has received awards from the American Swimming Coaches Association, College Swimming Coaches Association, International Swimming Hall of Fame, El Pomar Foundation and was the 2011 recipient of the National Great Comebacks Award for his cancer survival and contributions. He was also awarded the first-ever Association of Chief Executives of Sport (ACES) Chief Executive Leadership Award in 2015. He has co-authored three books with Sports Illustrated writer Alexander Wolff and was the executive co-producer for the recent documentary film, “The Last Gold,” which tells the story of the 1976 Montreal Olympic Games. He resides in Colorado Springs with his wife Nancy Grace Wielgus. He has four children.